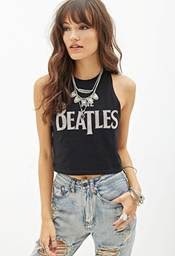 Bravado, Universal Music Group's leading global music merchandising company, has teamed up with specialty retailer Forever 21 to launch The Beatles x Forever 21, a mini collection of young men’s, women’s and junior’s tees featuring The Beatles logo, images and other trademarks of the legendary rock group. The complete collection includes a total of 10 pieces including tees, tanks, French terry pullovers and fleeces. Styles will be available in 250 stores with select styles going to all locations as well as online at www.forever21.com. See Zac Efron wearing Bravado and Ryan Phillippe wearing Bravado here on the Apparel Search fashion blog.